As a Cure for Illness. The custom of changing a person's name, as a tribute to his achievements, or as a sign that his condition will be improved, or particularly as an aid to his recovery from illness. 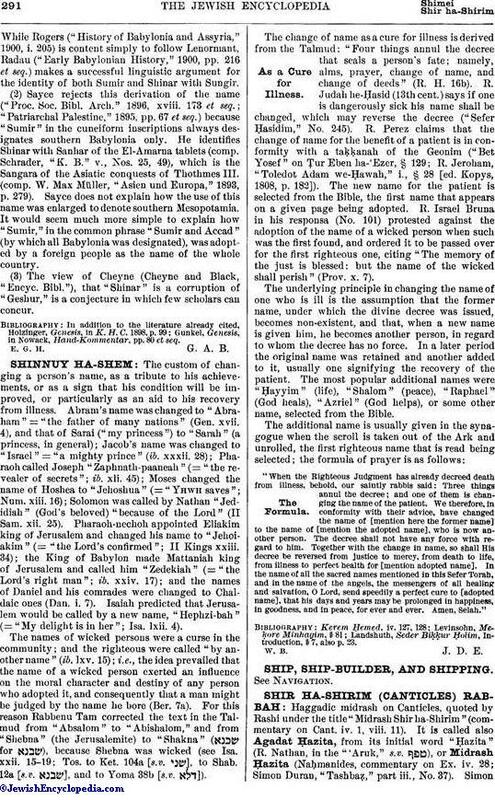 Abram's name was changed to "Abraham" = "the father of many nations" (Gen. xvii. 4), and that of Sarai ("my princess") to "Sarah" (a princess, in general); Jacob's name was changed to "Israel" = "a mighty prince" (ib. xxxii. 28); Pharaoh called Joseph "Zaphnath-paaneah" (= "the revealer of secrets"; ib. xli. 45); Moses changed the name of Hoshea to "Jehoshua" (= "Yhwh saves"; Num. xiii. 16); Solomon was called by Nathan "Jedidiah" (God's beloved) "because of the Lord" (II Sam. xii. 25). Pharaoh-nechoh appointed Eliakim king of Jerusalem and changed his name to "Jehoiakim" (= "the Lord's confirmed"; II Kings xxiii. 34); the King of Babylon made Mattaniah king of Jerusalem and called him "Zedekiah" (= "the Lord's right man"; ib. xxiv. 17); and the names of Daniel and his comrades were changed to Chaldaic ones (Dan. i. 7). Isaiah predicted that Jerusalem would be called by a new name, "Hephzi-bah" (= "My delight is in her"; Isa. lxii. 4). The names of wicked persons were a curse in the community; and the righteous were called "by another name" (ib. lxv. 15); i.e., the idea prevailed that the name of a wicked person exerted an influence on the moral character and destiny of any person who adopted it, and consequently that a man might be judged by the name he bore (Ber. 7a). For this reason Rabbenu Tam corrected the text in the Talmud from "Absalom" to "Abishalom," and from "Shebna" (the Jerusalemite) to "Shakna" ( for ), because Shebna was wicked (see Isa. xxii. 15-19; Tos. to Ket. 104a [s.v. ], to Shab. 12a [s.v. ], and to Yoma 38b [s.v. ]). The change of name as a cure for illness is derived from the Talmud: "Four things annul the decree that seals a person's fate; namely, alms, prayer, change of name, and change of deeds" (R. H. 16b). R. Judah he-Ḥasid (13th cent.) says if one is dangerously sick his name shall be changed, which may reverse the decree ("Sefer Ḥasidim," No. 245). R. Perez claims that the change of name for the benefit of a patient is in conformity with a taḳḳanah of the Geonim ("Bet Yosef" on Ṭur Eben ha-'Ezer, § 129; R. Jeroham, "Toledot Adam we-Ḥawah," i., § 28 [ed. Kopys, 1808, p. 182]). The new name for the patient is selected from the Bible, the first name that appears on a given page being adopted. R. Israel Bruna in his responsa (No. 101) protested against the adoption of the name of a wicked person when such was the first found, and ordered it to be passed over for the first righteous one, citing "The memory of the just is blessed: but the name of the wicked shall perish" (Prov. x. 7). The underlying principle in changing the name of one who is ill is the assumption that the former name, under which the divine decree was issued, becomes non-existent, and that, when a new name is given him, he becomes another person, in regard to whom the decree has no force. In a later period the original name was retained and another added to it, usually one signifying the recovery of the patient. The most popular additional names were "Ḥayyim" (life), "Shalom" (peace), "Raphael" (God heals), "Azriel" (God helps), or some other name, selected from the Bible. "When the Righteous Judgment has already decreed death from illness, behold, our saintly rabbis said: Three things annul the decree; and one of them is changing the name of the patient. We therefore, in conformity with their advice, have changed the name of [mention here the former name] to the name of (mention the adopted name], who is now another person. The decree shall not have any force with regard to him. Together with the change in name, so shall His decree be reversed from justice to mercy, from death to life, from illness to perfect health for [mention adopted name]. In the name of all the sacred names mentioned in this Sefer Torah, and in the name of the angels, the messengers of all healing and salvation, O Lord, send speedily a perfect cure to [adopted name], that his days and years may be prolonged in happiness, in goodness, and in peace, for ever and ever. Amen, Selah." Landshuth, Seder Biḳḳur Ḥolim, Introduction, § 7, also p. 23.